In the Ratio Studiorum, Eloquentia Perfecta develops in time, according to a predetermined series of steps meant to ensure sequential mastery. Andrew Tumminia, a Jesuit-educated English professor at Spring Hill College, examines this concept in an analysis of French Jesuit Rev. Michel de Certeau, S.J. Good writers see writing as a process of sifting through and even wrestling with competing ideas, formulating and organizing their own thoughts, and sharing them with others in a way that is clear, persuasive and respectful. At Le Moyne College, it is the goal of faculty to nurture writers who can do just that. At Loyola University Maryland, students have the unique opportunity to help new authors bring their books to life through the nation's first entirely student-managed book publishing house. At Seattle University, faculty rarely use the label Eloquentia Perfecta. Instead, they speak of “rhetorical flexibility”: the ability to thoughtfully adapt messages to different topics, situations, audiences and purposes. For many adults, the mere idea of speaking in front of an audience is enough to cause anxiety. But for students at Rockhurst University, public speaking is not just a pre-requisite. It’s a competition — a decades-old, extemporaneous rhetorical “Thunderdome” called the Robert W. Miller Speech Contest. When the University of San Francisco began re-envisioning its course curriculum in 2014, faculty decided to highlight Eloquentia Perfecta as a key element of the new 3-course sequence. A backbone of Jesuit education, Eloquentia Perfecta became a means to unify the department’s composition and public speaking courses. At the University of Scranton, students and faculty have much to look forward to every spring, including the return of a renowned campus tradition: a recitation of Plato’s Phaedrus...in togas. An element of Jesuit rhetoric, Eloquentia Perfecta revolves around cultivating a person as a whole, as one learns to speak, write and communicate effectively for the common good. To that end, the new Writing Center at Canisius College offers students help with writing at any stage of the writing process in any discipline. What does it mean to be Jesuit educated? Hear what students from Jesuit colleges and universities across the country have to say in our #JesuitEducated video series, available on YouTube! Visit jesuiteducated.net to learn more about the nation's 28 Jesuit colleges and universities. The February 2019 issue of Connections highlights interdisciplinary learning at Jesuit colleges and universities. Visit ajcunet.edu/connections to learn more. AJCU Higher Ed News is a weekly e-newsletter featuring the latest news from Jesuit campuses and organizations. The distinctiveness of a Jesuit education stems from its deep-rooted history and a mission grounded in faith and intellectual rigor. Since its beginnings in 1548, when the first Jesuit institution opened its doors in Messina, Sicily, Jesuit higher education remains committed to academic excellence, service, leadership and caring for the whole person. Click here to learn more about Jesuit mission and identity through our publications, videos and links to related websites. 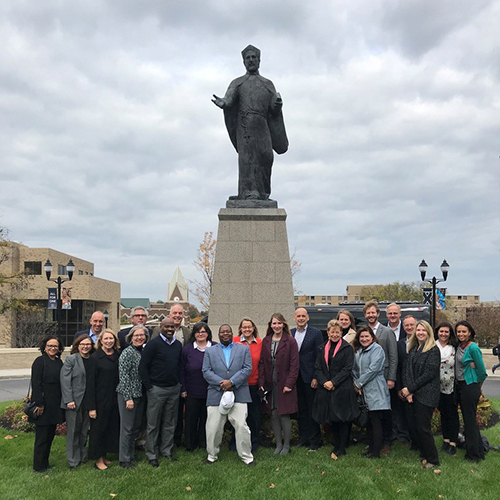 At the request of the Superior General of the Society of Jesus, the Provincials of the U.S. Jesuit Provinces and the Presidents of AJCU member institutions have established a self-study and peer review process for reaffirming the Jesuit, Catholic mission priorities of U.S. Jesuit colleges and universities. Online materials have been created to assist with this process, known as the Mission Priority Examen (MPE) process; click here to view them online. Our institutions are committed to the pursuit of social justice, and teaching students how to become men and women for and with others. Learn more about AJCU's commitment to justice through our Federal Relations activities: Visit ajcunet.edu/federal-relations.